The Great University Gamble — Privatising English Higher Education against the background of global economic crisis. Similar to other public sector areas in the UK, Higher Education (HE) is currently under attack. The introduction of tuition fees of up to £9000 per year, the downward pressure on wages and the attack on pensions imply a fundamental transformation of the sector. 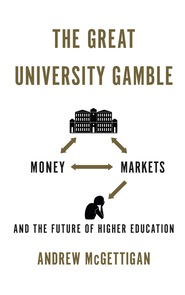 In The Great University Gamble: Money, Markets and the Future of Higher Education (Pluto Press, 2013), Andrew McGettigan unravels the true objectives underlying restructuring in English HE. In this post, I review this fascinating book and provide some additional reflections on aspects of resisting restructuring. The cuts of direct government funding for universities was part of the 2010 Comprehensive Spending Review. Having assumed office with the promise to get national debt under control, cuts across the public sector including Higher Education (HE) were justified by the new coalition government through reference to the fallout of the global economic crisis. In The Great University Gamble, Andrew McGettigan unravels the true objectives underlying this policy. The crisis provided a convenient justification for cuts, he concludes, but it was the opening up of HE to private competition, which was the real purpose of restructuring: ‘new private providers are encouraged to enter the sector, established charitable institutions must become more commercial and more corporate in their governance, new opportunities are created for private equity’ (P.185). In exchange for losing government funding, universities have been allowed since September 2012 to charge students annual fees of up to £9000. It is the risky way in which the related student loans have been organised, which clarifies that financial savings cannot have been the prime motivator of government policy. In the new system, instead of providing direct grants to universities for teaching, the government advances cash to the Student Loans Company, which in turn provides loans to students so that they can cover their tuition fees. Any saving realised through the new regime results from an accounting trick. ‘Grants paid to institutions are expenditure. A £3 billion cut to grants is a £3 billion cut to expenditure. Loans work differently. The money loaned is expected to come back — therefore it is not straight-forwardly expenditure. Initially, only the estimated loss on loans counts as expenditure’ (P.159). Currently, the government operates on the assumption that it will lose 32 per cent of what has been loaned, which if calculated as expenditure, will still imply a reduction of annual spending on education. This accounting practice, however, bears great risks. Student loans have a long re-payment cycle. For years, governments will have to advance billions of pounds of fees without knowing exactly how much will be paid back. ‘Outstanding student debt, money owed to the government, will climb from £35 billion in 2012 to £191 billion by 2046’ (P.165). And while the government calculates with a loss of 32 per cent, other assessments predict 37 per cent, which would result in an additional £680 million per year of costs. In general, ‘these loans are unsecured, there is no asset connected to them that can be cashed in, such as, say, a mortgage backed by property. We have to assume that there are no profound political or economic changes’ (P.48). Why would the government embark on this financial gamble at a time, when it has been proven that gambles of this kind can go horribly wrong? The government’s real ambition, McGettigan convincingly argues, is the partial privatisation of HE in order to introduce market competition in the sector and to provide new outlets for private investment. It is the same rationale, which also underlies NHS reforms and the restructuring of primary and secondary education. Public services and their democratic accountability are eroded in favour of the market and private companies. It is the shift to fees, which gives new providers and private equity access to the student loan book, thereby ‘creating new outlets for value extraction’ (P.78). And with private providers entering the market, ‘the majority of universities will need to become more akin to commercial operations, charging for services’ (P.5). In short, the nature of the whole sector is transformed. Private companies such as Pearson/Edexcel have not yet been given Degree Awarding Powers. Nevertheless, throughout the volume McGettigan provides a number of examples of joint ventures in which private companies become directly involved in the organisation of HE in order to make profit. Commodification is part and parcel of private sector participation in HE. ‘The higher fee encourages the applicant to consider undergraduate study as a form of “human capital” investment, or the purchase of a financial asset, the returns on which are to be seen after graduation in the form of higher earnings’ (P.25). Unsurprisingly, this focus on high paid employment and employability comes at a cost. Subjects not directly related to employment, as for example Philosophy or History of Arts, are likely to lose out. ‘Becoming responsive to demand may see universities shedding subjects which could lead to lost capacity and a contraction in the breadth of what is on offer’ (P.63). Wider public goods such as the formation of critical citizens will be lost as a result of this sole focus on employment. In sum, this book provides an excellent and highly important overview of current restructuring of HE in England and its underlying purpose of privatisation. And yet, for those of us interested in resisting restructuring, it can only be a starting-point. The future of HE in England does not only depend on who has the ‘better’, ‘objective’ arguments about what a ‘good’ HE system should look like. Restructuring is first and foremost also an issue of balance of power between different interests in wider society. As McGettigan makes clear, it is the interests of private equity to find new investment opportunities, which are behind the government’s agenda (P.8). In order to resist these interests, counter power needs to be built up through broader mobilisation within HE and society more widely. In the reminder of this review, I will reflect on several additional aspects relevant to resistance. First, current restructuring of HE does not only consist of an increase in tuition fees and private sector participation, which is mainly the focus of McGettigan’s book. It is also reflected in the attacks on pensions as well as staff’s general terms and conditions. Moreover, the sector is increasingly characterised by performance related pay schemes intended to ensure the close monitoring of employees. An ongoing process of de-professionalisation is reflected in the transformation of academics from autonomous, independent and collegial professionals into a standardised workforce, operating within an ever tighter net of regulations. Considering that these cuts in pay and working conditions are imposed at a time when ‘the sector overall in England is at its healthiest for many years’ (P.113), it is clear that employers have fully bought into the government agenda. Universities themselves have increasingly contributed to the marketisation of HE especially through the way they have tried to establish themselves as key players in an increasingly global market of HE, be it through campuses in other countries, be it through joint ventures with institutions elsewhere around the world. Resistance to restructuring needs to confront employers head on and forget past notions of supposedly joint interests between university employers and staff. Second, when reflecting about resistance, we need to acknowledge that restructuring offers powerful incentives to individual academics, who perceive university administration as an attractive alternative career route to the traditional focus on excellence in teaching and research. The dramatic increases in Vice Chancellors’ (VCs) pay are regularly reported in the news. Underneath VCs, however, we can observe the rise of a powerful, well paid and expanding group of academics turned administrators, who personally benefit from restructuring through increased salaries and status. Resistance to restructuring needs to take into account the complicity of some colleagues in these developments and find an appropriate response. What sort of trade union? Finally, reflecting on resistance to restructuring also requires reflecting on the appropriate type of trade union organisation for this purpose. The University and College Union (UCU), which organises employees across Further and Higher Education in the UK, is at a crossroads. Should it pour further resources in the representation of individual members and transform itself into a kind of service union or should it develop more strongly an image of a campaigning union with the goal of impacting on the shape of HE as a whole? Clearly, it is only the latter strategy which may be able to resist restructuring successfully, while the former can at best ameliorate the situation for individuals without challenging restructuring itself. These additional reflections should not, however, distract from the achievements of this fascinating book. McGettigan succeeds at providing an in-depth overview of key aspects of current restructuring and successfully uncovers the political and economic rationale driving these processes. It is a must-read for all those interested in understanding current change in HE in order to resist it.